Kiva is a non-profit organisation which provides micro finance loans to entrepreneurs in the developing world. It was founded in 2005 in San Francisco and has since funded around $950 million (£770 million) in loans. You lend in multiples of $25, but unlike most P2P lending sites you receive 0% interest. Borrowers may be charged interest by the local organisations that work on the ground (more on this below). Capital is at risk though historically defaults are low: the repayment rate is 97%. Once your loan repays you can either re-lend it, donate it to Kiva the charity, or withdraw the balance from Kiva. Note: I’ve just used Kiva for a few days. These are my initial impressions and working notes rather than an in-depth review. To help support International Women’s Day, on the 8th March 2017, Kiva are running a ‘free trial’. For new users who sign up via the page www.kiva.org/investinher, they will receive a free $25 to make their first loan. Since 2005, Kiva has been working to connect people through lending to alleviate poverty. On Kiva, $25 can accomplish so much – it can help a person start their business, attend school, access clean water or make their dreams a reality. What makes Kiva different from other charities is that you can make a small loan, not a donation, to help make someone’s dream a reality. It’s a hand up, not a hand out. If you invest with your own funds, when a borrower pays you back, you can keep relending the same money over and over to multiply your impact. How cool is that? I should also mention – 100% of every dollar you lend on Kiva goes to funding loans. Kiva covers costs primarily through donations from our lender community. Not all charities are alike, some dedicate a significant proportion of income on marketing and administration rather than direct spending on their charitable mission. There is a US based tool called ‘Charity Navigator‘ that attempts to break down spending and compare charities against one another. Kiva scores very highly on Charity Navigator: 97.59 out of 100 on financials and 96.00 out of 100 on accountability and transparency. For every 5 cents they spend on marketing they get $1 in donations, and have an administration expense of 12.8%. Compare this to Oxfam USA for example which spends 7.5% on administrative expenses but 15 cents in marketing for each $1 donation. I checked against a few other well known names: Save The Children, Unicef, The American Red Cross and it was a similar story: Kiva spends less on marketing but has higher administrative expenses. They are much smaller so perhaps cannot benefit from the same economies of scale. From what I can tell, Kiva runs lots of ‘free trial’ or ‘refer a friend’ promotions as marketing. This gives a $25 free lending token to the new user or referee and is a great way to encourage people to spread the word. The money can never be withdrawn by the referrer and can only be used for ongoing charitable lending. The CEO of Kiva, Martin Tschopp, was previously the Vice President of eBay advertising. So they have a tech-focused leader at the helm who brings his marketing experience with him. Kiva works with field partners to find borrowers. Although Kiva does not charge interest, many of these intermediary partners charge interest to cover administrative costs. In 2014 the average interest rate was 35%. It has been suggested by Julia Kurnia (the founder of similar charity Zidisha.org) that field partners may add interest to help cover the cost of defaults, so they can report low default rates back to Kiva. 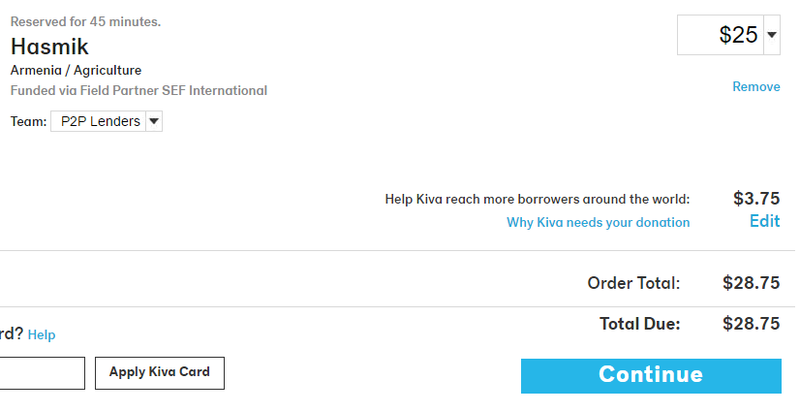 Kiva have tried to solve this problem with ‘Kiva Zip’, which allows direct lending at 0% interest. They released it in 2011 in Kenya and the US, but it does not seem to have expanded since then. I’m not even sure how to find Kiva Zip as a lender. “it remains unclear under what circumstances, and for whom, microfinance has been and could be of real, rather than imagined, benefit to poor people” (page 75 DFID report linked above). The review suggests we should focus charitable donations on alternative poverty reducing interventions and the need for access to other financial products such as savings, and insurance rather than just credit. You can filter loans by country, gender, business activity, loan-term and some other attributes. There are photos of the borrowers themselves and once you click a loan you go to a detail page with more information. I’ve just used Kiva for a short period, but one useful thing I’ve found so far is to look at the ‘Is borrower paying interest’ section in the loan details. If they are I scroll down to see the average cost to the borrower by the field partner. You add loans that you’d like to contribute to a ‘basket’, similar to something like Amazon or most online shops. The loans are then reserved for a short period of time, I think about 45 minutes. Once you want to actually fund the loans, you go to your basket and pay via paypal. This goes towards the administrative costs of running Kiva and to their marketing. If you just want to make the $25 loan you can click ‘Edit’ (in blue above) and reduce the slider to $0. If you are a UK taxpayer, you may be able to find a more tax-efficent way of donating to Kiva the charity (I haven’t looked into it). Kiva encourages you to lend more money through gamification: point-scoring and working with other lenders to achieve shared goals. One way they do this is through a map on your profile that colours in the countries you’ve lent to. You can then use an option to filter to only show borrowers in countries you haven’t yet to lent, so over time you can gradually colour in the map. There are also Kiva Teams. You join a team and associate each new loan with the team (you cannot associate old loans). You have a feed with the loans that everyone else is making and can send team messages. You can view a nicely made ‘impact report’ that breaks down the lending that you are collectively making. It is a nice way to feel part of doing something for the greater good. Can You Withdraw Money From Kiva? All funds added into Kiva accounts must first be used to make microloans on Kiva’s website before being withdrawn. Once funds have been loaned out and repaid, the owner of the funds may choose to withdraw that money into a PayPal account. This appears to be in place to help prevent against money laundering. For UK residents lendwithcare could be a good option. It’s run by Care International, a UK registered charity with a 70 year history. Loans are for £15 (~$18.50), and like Kiva the balance can be withdrawn, re-lent or donated if it’s paid back. Zidisha.org seems to be similar to Kiva but aims to have lower interest for the end borrowers. It has funded about $9 million in loans according to their open statistics since founding in 2009, a fraction of Kiva’s $950 million. Zidisha cuts out the intermediaries and allows direct lending between lenders and borrowers at 0% interest. Zidisha add a 5% charge to borrowers to cover money exchange fees. Borrowers also need to contribute towards a provision fund against bad debt. I think a position of skepticism is warranted. Micro finance sounds such a great idea, however there is generally considered to be NO evidence that it is effective https://www.theguardian.com/global-development-professionals-network/2015/jun/10/the-microfinance-delusion-who-really-wins. Thanks for sharing a more skeptical view Sara. It is easy to get carried away by a concept that is great in theory, nothing compares to tackling the route causes of poverty! If you compare to some of the things that exist already in the for-profit lending market then even a ‘not-perfect’ Kiva may be a huge step in the right direction. For example I had a look recently at a European (for-profit) P2P lender who made consumer loans in some developing markets (like Georgia, Russia). The lenders take a 12%+ cut, the P2P platform takes a bigger cut, the loan intermediaries take a cut and there is a further cut of sorts to go towards provisions against bad debt. You end up with low income consumers paying 100%+. If Kiva can step in and provide loans that create value at lower interest rates then it would be a vast improvement. It seems to me is that basically I am not landing money to people, I am landing it to charity organization that then take interest from the borrower. how much interest is the key question, and that’s still not clear, plus, we all now that sometimes people running “none profitable” organizations end up giving them self a very profitable salaries and I. Am not sure if kiva check this kind of stuff.